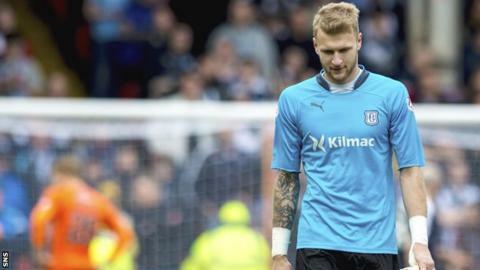 The Scottish Football Association's disciplinary panel has rejected Dundee's appeal against the red card shown to their goalkeeper Scott Bain in Sunday's derby against Dundee United. He will miss Dundee's match against Ross County at Dens Park on 2 April. Bain, 24, was sent off for a foul on Billy McKay inside the penalty area that was deemed to have denied McKay an obvious goalscoring opportunity. Dundee boss Paul Hartley had pointed out the presence of a covering player. McKay slotted home the resultant penalty to halve his team's deficit before equalising in injury time. Bain could make his Scotland debut against the Czech Republic on Thursday. He is one of four uncapped players in Gordon Strachan's squad for the friendly in Prague.